Lost on Table Mountain. The Graphic, 20 Oct 1883. 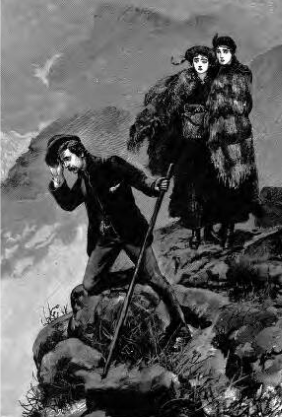 Saturday, Feb 1, 1890 a short article appeared in the Whitstable Times and Herne Bay Herald, Kent, England, about a party consisting of Robert Lightfoot, Nellie and Grace Lightfoot and Henry Barnett-Clarke who were trapped on Table Mountain by a sudden change of the weather. They were preoccupied with a very rear butterfly that is only found on Table Mountain and then, only very occasionally, and did not notice the changing weather. A cloud settled on the mountain with mist and they became disoriented. Wisely they decided to camp at the top for the night and descended the next day. A more dramatic account of a rescue on Table Mountain occurred in The Leeds Times, 3 September 1881, page 7 describing a rescue on Table Mountain. An exciting story – The Cape Times narrates the exciting incident of a search for two men, and their gallant rescue from a position of extreme suffering and peril. It became known, on a certain Tuesday at the end of June or the beginning of July, that Richard Rickards and Charles Derry, a couple of tourists, had on the previous day fallen into a ravine near the top of Table Mountain, accompanied by a third man names May. These persons had made the ascent, Derry being supposed to know the mountain. It was about four o’clock on the Monday afternoon when they began to descend, choosing imprudently a course on the Camp’s Bay side, far from the well-known and comparatively safe road which is known as Platteklip. Derry, taking the lead, conducted his friends down the gorge until be had brought them to a narrow ledge where progress was stopped. In endeavoring to return, one of the men slipped. It appears that he had tried to make room for Derry to pass him, so as again to take the leadership of the little party. The slip caused all three men to lose their footing, and they fell together a sheer depth of forty feet (12 meter), after which they rolled a considerable distance over stones and among bushes. Rickards breaking his leg, and wedged between two rocks. Derry fell and rolled to a lower depth, and was severely cut and bruised about the face and body. He and May, who was the least hurt of the three, managed, by mounting on Derry’s shoulders, to get a hold on the rugged precipice, and to climb up, and up, till he emerged from the ravine down which they had fallen. By piece of good fortune, which neither he nor any inhabitant of the district can account for, this man was able to effect a safe descent of the mountain, pursuing at hap-hazard a course quite unknown to ordinary climbers. for them, they would surely have perished. Guided, it would almost seem, by the “homeing instinct” which has been attributed to some animals, May reached a place of human habitation, and told his urgent and piteous tale to helpful hearers. It was late on the Tuesday when the appeal for succour was made. No time, however, was lost in responding to it. Two brothers, named Sedgwick, knowing the mountain, like a map, raised a party of railway men, with six of whom one of these gallant leaders started by lantern light at ten o’clock on a dark wintry night. It was Mr. A. M. Sedgwick who led the first search party, he having previously gleaned from his informant such accounts of the spot where the accident happened as would direct his steps. One object that had fortunately fixed itself in May’s mental picture of the surrounding scene, was a spring of water bubbling up from the foot of a large stone. The description was recognized by the experienced mountaineer, who shaped his course from that readily-remembered place. Making the ascent by the Platteklip, Mr. Sedgwick and his companions held on their way downwards, the lanterns showing only the wall of rock at the side, but throwing no gleam on the danger that might be at their feet. Gradually the gorge closed in, while the footing in the watercourse which served for a path was so uncertain that the help of ropes from above was needed to enable the explorers to continue their descent. At length they came to the edge of a ravine where further progress was barred, and now from below to their repeated shouts a feeble answer was heard. It seemed to tell that he who spoke was powerless to move, his leg being broken; and that his fellow-sufferer was dead. This mistake, whether made by the speaker or by those above, in misrepresenting the weak and indistinct accents, was soon rectified. It was then four o’clock and there was no possibility of making any attempt to remove the men before daylight. Their forms could just be made out sitting on the base of a wall of rock below. A flask of brandy was lowered to them by a rope; but so utterly exhausted and benumbed were they from hunger and rain and cold that they could not remove the stopper from the bottle. This was done for them, and the vessel was again lowered, after which all that could be done was to wait, wishing for day. Meanwhile, at three o’clock, Mr. C Sedgwick, with a second party, followed up the mountain and joined the first division of rescuers, as they were waiting for dawn to begin the work of deliverance. About six o’clock operations were commenced. From the top of the mountain roped were let down, and also from the ledge immediately overhanging the ravine. On that narrow ridge, where the accident had happened, three men, with Mr. Sedgwick, were able to keep a foothold, which they had made more secure by clearing away some of the small stones and earth, and by taking advantage of every stunted bush. The lines from above also served to steady them as they let down their ropes over the heads of the two men. Only one of them, Richards Rickards, was able to assist in adjusting the nooses of the ropes, and Mr C Sedgwick volunteered to be let down to make the attachment secure.